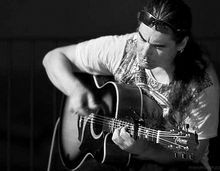 Formerly of Big Geraniums and Lia Luachra, Jon Hicks is a world renowned guitarist and singer/songwriter. He injects an eclectic mix of Irish, Spanish, and jazz influences into his work which has the effect of whisking you in moments from Galway to Gallicia to the ‘gator-infested swamps of Louisiana. Click here for solo sample. and here together with Cornelia.